Does this sound religious, to you? It absolutely should, as this pizza is nothing short of a religious experience. It likely seems wacky to you but sometimes I dream about food, especially pizza. Don’t judge me, O.K? After all, I can’t imagine a world without pizza, can you? 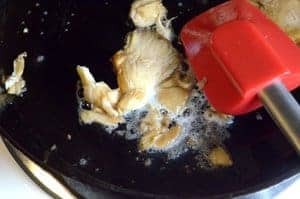 Start by gently sauteing some fresh mushrooms in butter. Don’t overcook the mushrooms as they have a brief stint in a hot oven, ahead. Next, carmelize some shallots and microgreens with some butter, sugar and red wine vinegar. Toss the microgeens in at the very end. 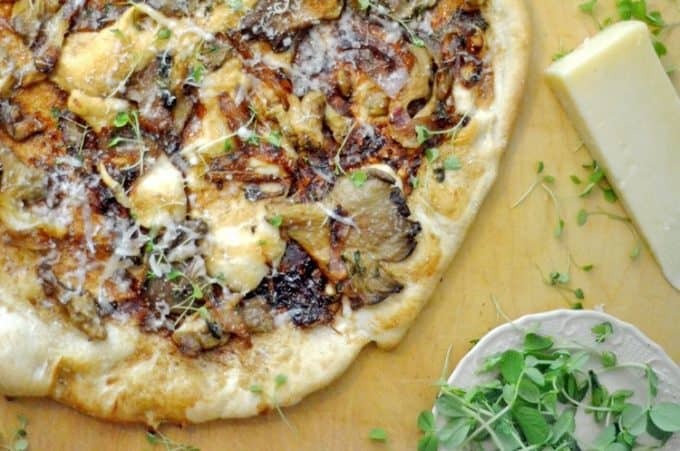 This Balsamic Mushroom Pizza with Caramelized Shallots & Microgreens starts with fresh mushrooms and fresh microgreens, organically grown from our urban farm friends at Grow Local here in Neenah. 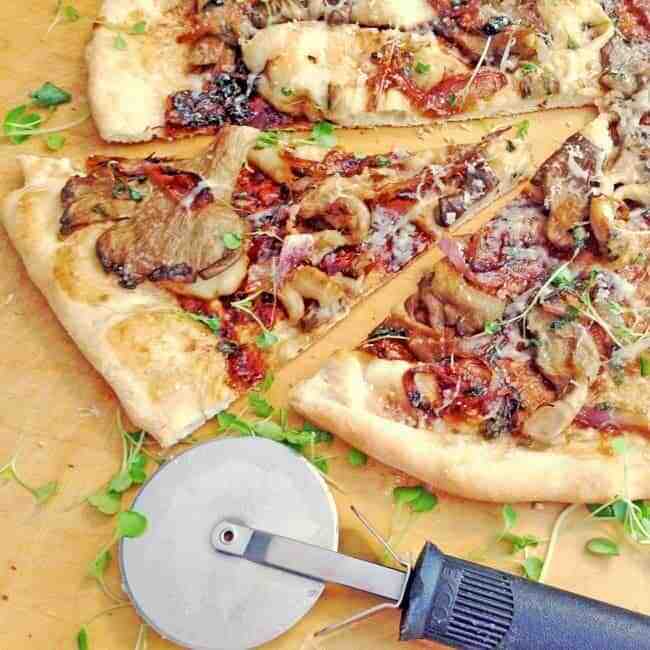 We added some caramelized shallots to the mix, all atop a fresh pizza dough slathered in 18 year old balsamic vinegar. Again, if this combination of vegetables and flavors sounds heavenly, it’s all that and more. Wanting to ensure there would be no chance of ending up in culinary pergatory, I topped this food for the Gods with some fresh grated Asiago cheese. It worked. 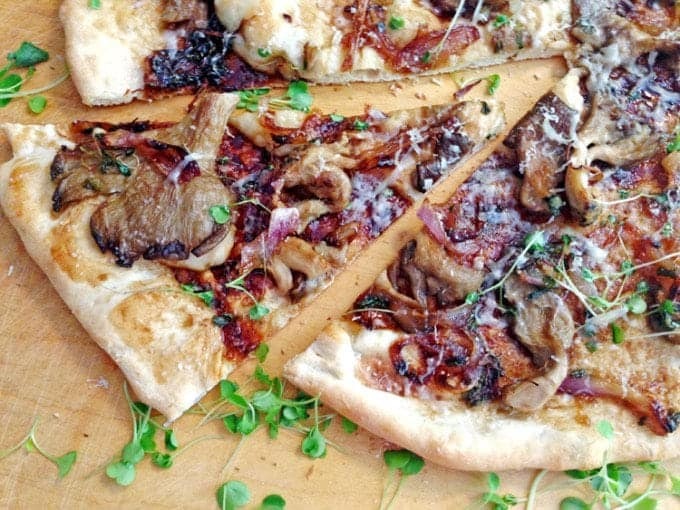 When our 11 year-old son foodie-son, Isaiah, took his first bit of this Mushroom Balsamic Pizza with Caramelized Shallots & Microgreens, he gave me a knuckle-bump before he even got to the second bite. This was a very good sign. All religious signs aside, pizza is a passion of ours here on Platter Talk. 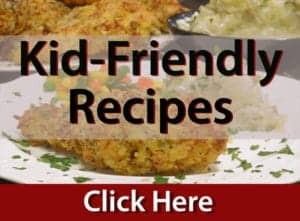 We’ve recently discovered the beauty and taste of cooking with fresh micorgeens and the relevance of sustainable agriculture on our planet of dwindling and finite resources. 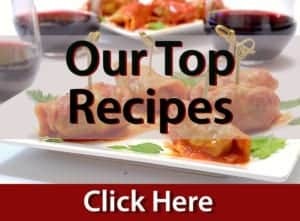 Be sure and have a taste at some of our Pizza creations! Think hot and fast. If using a stone, you want your oven as hot as possible. Reduce heat to 450 if using a metal baking pan. Place dough on a hot pizza stone for a crispy and chewy crust. 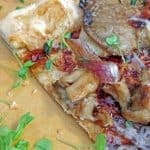 To enhance their flavor, briefly saute vegetables like mushrooms, peppers and onions prior to placing them on the pizza. Don’t over-saute your vegetables as they are going to continue to cook in the oven. Save the cheese topping until the pizza comes out of the oven. This prevents the cheese from over-baking and will preserve its flavor. Ditto for delicate herb toppings such as basil, for the same reason. 1 pizza dough stretched to conform to pizza stone. 1 shallot skin removed, root intact. Prepare pizza stone with non-stick coating, place in oven. Using skillet, melt 1 tablespoon butter over medium high heat, saute mushrooms until tender, remove and set aside. Reheat skillet over medium heat, add remaining 2 tablespoons butter. Slice shallots lengthwise, about 1/4" thick, then slice again to form square "matchstick" slices. 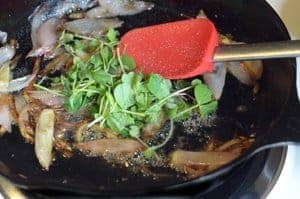 Place shallots in skillet and saute for about 10 minutes, stirring frequently, until brown. Add sugar and vinegar, stir and add microgreenss. Remove stone from oven and place pizza dough on top. Using pastry brush, evenly apply balsamic vinegar. Top with mushrooms, shallots, and microgreens and place in oven. Reduce heat after 5 minutes and bake an additional 5 to 10 minutes until brown and crispy. 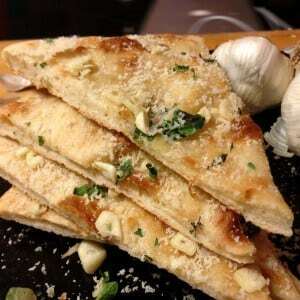 Remove pizza from oven, sprinkle Asiago cheese on top. 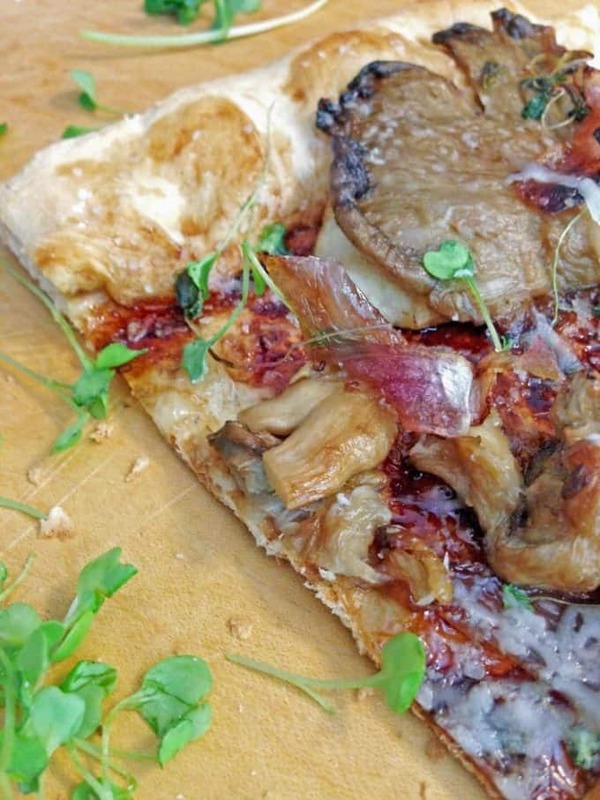 Mushrooms on pizza – always yes. Like the way that the flavors come form the vegetables and there is no sauce to disguise those earthy flavours. Meeta, this was one of our favorite summer CSA creations! Thanks so much for stopping by for some Platter Talk! I love veggie pizzas so I know I would love this one. Pinning so I remember to make ASAP. Thanks so much, Cristie. Hope you try this one! Thanks so much and food is at the top of our “to dream about” list! balsamic anything is a winner! Love that you paired it with mushrooms and caramelized onion. Divine! Thanks for the lovely comments, we loved this combo! We just might be! Thanks so much for stopping by! I’m totally making this on a gluten free crust! Love me some balsamic vinegar! Thanks for linking up to Saucy Saturdays! Thanks, Jennifer, I know you’ll enjoy this! Thanks, Dini! Wish you could have been here to enjoy it with us. This just looks amazing! 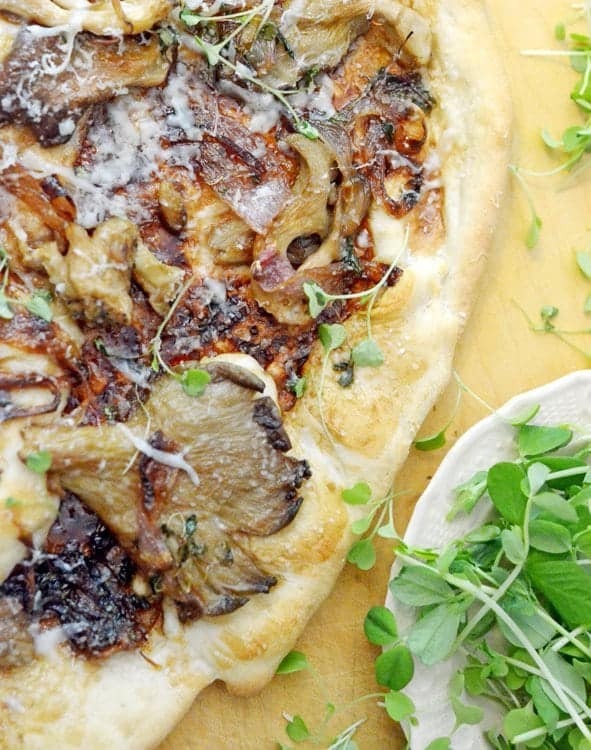 I can’t say no to mushroom pizza… especially when it looks like this!!! This pizza looks heavenly! I absolutely love mushrooms and caramelized shallots, and I love that they’re the real star here rather than a pizza sauce. And good move on the grated asiago…YUM! Thanks so much, Beeta. I love pizza and it’s always fun to put a new one together using ingredients that epitomize the season; speaking of which, I hope you are having a wonderful summer! I love that there is no “sauce” – just healthy, delicious vegetables and oh, the cheese. Love the cheese! Thanks so much Patty; this pizza truly is the stuff dreams are made of!